World Health Organization (WHO) released a ranking data that placed Onitsha as the most polluted city in the world. Out of the twenty most polluted cities in the world Onitsha was ranked number one. 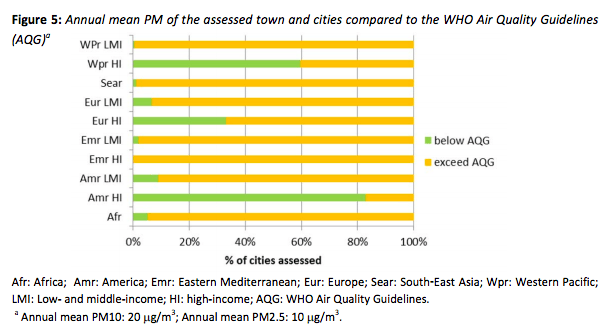 “The most polluted city in the world, according to the WHO data, is Onitsha, a fast-growing port and transit city in south-eastern Nigeria that recorded levels of nearly 600 micrograms per cubic metre of PM10s - around 30 times the WHO recommended level of 20 micrograms per cubic metre… the data only includes measurements for particulates and does not include forms of air pollution such as NO2 and ozone, ” as reported by UK Guardian. "Particulate matter," also known as particle pollution or PM, is a complex mixture of extremely small particles and liquid droplets. Particle pollution is made up of a number of components, including acids (such as nitrates and sulfates), organic chemicals, metals, and soil or dust particles." “Of the 3,000 cities in the WHO’s air quality database, the most polluted at the time of measurement was Onitsha, a fast-growing city in Nigeria, which recorded roughly 30 times more than the WHO’s recommended levels of PM10 particles. Peshawar in Pakistan was in second place, followed by Zabol in Iran. These cities are mostly located in rapidly growing economies in the Middle East and South East Asia. Four of the 20 urban areas with the worst air quality at the time of measurement were in Nigeria, three were in Saudi Arabia, three were in India, and two in Iran. 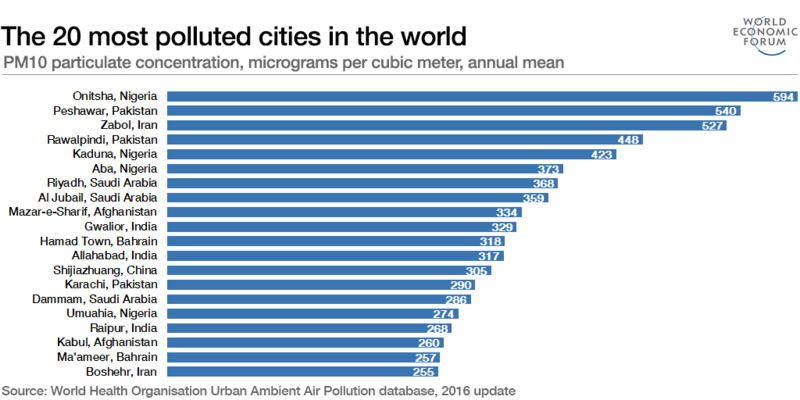 China, which has been working to tackle its air pollution problem, is the only country with just one city on the most polluted list. The Nation Newspaper reported that: " The Editor of Anambra News, a monthly local newspaper in Onitsha, Anambra State, Mr Ik Udendu, has been killed by suspected assassins. The late Udendu was returning from Onitsha to his home in Ogidi, Idemili North Local Government, on Saturday night, when he was reportedly killed. Police Commissioner Ballah Nasarawa confirmed the killing in Awka, the state capital. He said he would investigate the matter to know those behind the killing." It was disclosed by a relative that Udendu went to his printing press at Onitsha to review his printed papers but he never returned from the visit because he was later found murdered. The Chairman of the Nigeria Union of Journalists (NUJ), Comrade Henry Nwasike, and Secretary, Comrade Ifeoma Anumba, could not be reached for reactions yesterday. The Nation further reported that: "The late editor’s elder brother, Chukwulozie, also a journalist and publisher of the paper, said the body of his slain brother had been deposited at the Iyi-Enu Hospital Mortuary, Ogidi, for autopsy. Chukwulozie said his late brother had no misunderstanding or disagreement with anybody that could have warranted his murder. He, however, said he received an anonymous phone call on Saturday night that he should pick his brother’s body in front of a restaurant at Afor Nkpor. The publisher said the family contacted the vigilance group, which contacted Ogidi Police Station. According to him, the police took the body to nearby Iyi-Enu Hospital Mortuary. " Onitsha city has lost one of the great contributors of journalism and development in Anambra State. President Goodluck Jonathan has promised to go on exile if he fails to build the Second Niger Bridge before completing his term in 2015. The Nigerian leader made the promise in his remarks at a Town Hall Meeting held yesterday in the commercial city of Onitsha as part of activities marking his one-day visit to Anambra State. During the visit, Jonathan commissioned several projects, including the oil production facilities of Orient Petroleum at Aguleri, the massive SABMiller Brewery at Onitsha and the Chukwuemeka Odumegwu-Ojukwu Gateway in Onitsha. The issue of Second Niger Bridge naturally came up during the Town Hall Meeting since Jonathan had during his campaigns for the 2011 presidential ballot promised to construct the bridge if elected President. Experts have warned that the existing bridge constructed in 1965 may collapse any time in view of the heavy traffic. Speaking yesterday at the Town Hall Meeting, the Nigerian leader said that “when the first bridge was built, it was during the presidency of Nnamdi Azikiwe; the second Niger bridge will be built under the presidency of Azikiwe Jonathan.” To further reassure the people, the President said he would go on exile on the completion of his term if he does not build the bridge. To convince his audience that serious efforts are being made to build the bridge, invited Works Minister Mike Onolomemen and Finance Minister Dr. Ngozi Okonjo Iweala to brief the people on what was being done about the construction of the bridge. Onolomemen reeled out the technical details about the design of the bridge and the companies bidding to construct it, while Okonjo-Iweala unfolded details about the financial arrangements being made to construct the bridge. At the end of the meeting, some of the participants, among them businessman Prince Arthur Eze were so thrilled that they urged President Jonathan to seriously consider seeking re-election in 2015. 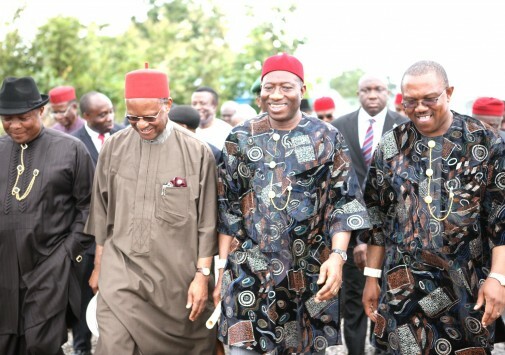 PRESIDENT GOODLUCK JONATHAN (L), WITH THE FORMER COMMONWEALTH SECRETARY-GENERAL, AND CHAIRMAN, ORIENT PETROLEUM RESOURCES PLC, CHIEF EMEKA ANYAOKU, AT THE INAUGURATION OF ORIENT PETROLEUM RESOURCES PLC PRODUCTION SITE AT AGULERI-OTU IN ANAMBRA ON THURSDAY (30/8/12). 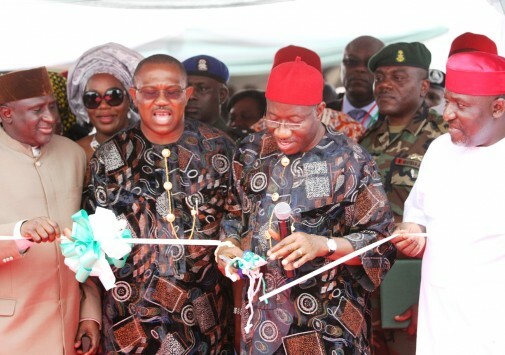 PRESIDENT GOODLUCK JONATHAN (3RD R) INAUGURATING ONITSHA INLAND WATERWAYS PORT IN ONITSHA ON THURSDAY (30/8/12). VIOLENT protest sparked off in Onitsha, the commercial city of Anambra State Thursday, over the killing of a commercial bus driver simply identified as Edwin by a trigger happy policeman for failing to part with N50 tip. According to the conductor of the bus, Samuel Ekwueme who was crying uncontrollably, the police, at Anambra State Broadcasting Service (ABS) Awka Road Onitsha junction check point, had stopped the Coaster bus driver with registration number AA 763 AHB and asked for N50 tip, but the driver gave him the normal N20. The policeman said to be a Hausa man refused and insisted on collecting N50, but was told by the driver that they just came out and that they should allow them to go and come back. The killing of the driver exploded the bottled up anger of residents of Onitsha and the fragile peace in the state that have lost over 30 people to the bombing and shooting of the Boko Haram as residents took to the streets in protest of the killing of the bus driver said to be member of the Movement for the Actualization of the Sovereign State of Biafra (MASSOB). It was gathered that four passenger in the bus sustained bullet wounds while others in an attempt to escape sustained serious injuries when the bus became uncontrollable following the shooting of the driver by the trigger happy cop. The situation however took a dangerous turn when angry mob comprising of drivers and commercial motorcyclist popularly known as ‘okada riders’ went on rampage with the corpse of the driver, for reprisal attack on Hausas people in Onitsha. The bus was said to be fully loaded with passengers who took off from Nkpor junction and was heading to the Ose Okwodu and Onitsha Main Market, when the incident happened. She also said that when the policeman first demobilized the bus by shooting at the tires of the vehicle and it could not move again, a situation she said helped the killer cop to shoot at the deceased from the window on closed range after shattering the glass of the vehicle. The killing took an ethnic sentiment as Coaster drivers and angry mob in Onitsha went on rampage demanding the killing of Hausa people on the ground that the policeman who shot the deceased was a Hausa man. The situation also escalated when angry mob descended on the police team earlier sent by the Anambra State Commissioner of Police, Mr. Muhtari Ibrahim to come and appeal to the rampaging crowd as the team were almost lynched but for the intervention of MASSOB Director of Information, Mr Uchenna Madu who pleaded with the aggrieved protesters that their leader Chief Ralph Uwazurike is against any reprisal attack. The Onitsha Ploice acting Area Commander, Mr Roland Omatoje and the Divisional Police Officer in charge of Central Police Station, Onitsha Mr. Abdul Yusuf escaped death by the whiskers when the angry mob descended on them when they led their men to the scene of the incident . Reacting to the development, MASSOB leader, Chief Ralph Uwazurike advised his members not to touch any Hausa man but should dismantle every police check point within the zone with immediate effect. Uwazurike who spoke through his director of information, Mr Uchenna Madu said dismantling of all police check point has became imperative at a time when the security of Ndigbo was no longer safe even in their land. He however, urged MASSOB members to leave Hausa people alone and concentrate on dismantling all police check points within the zone”. When contacted, the Anambra State Police Commissioner, Mr. Muhtari Ibrahim said the killer cop had been arrested and would soon undergo orderly room trail and prosecution. He called on the rampaging mob to calm down as efforts to settle the matter had commenced. WHATEVER else is being celebrated as Anambra State marks the 20th anniversary of its creation, roads cannot be one of them. Neither the Federal nor state-owned roads are in a good shape, except perhaps, a few in and around Awka, the state capital. The roads in and around Onitsha, a city that is unarguably one of the nation’s most important commercial centres, however, are among the most neglected. Driving through Onitsha from Asaba, the Delta State capital, is increasingly becoming an exercise motorists would rather avoid.Once past the Niger Bridge, the inevitable bumpy ride starts, since that route through Upper Iweka is the only entrance from Asaba. Several erosion sites and potholes have turned Upper-Iweka into an area, which has gained notoriety for accidents. Because of the notorious traffic jam between the head-bridge and the Enugu-Onitsha Road or Onitsha-Owerri Road, the inner-city roads and streets through which motorists meander and maneuver to get out of the logjam have become dilapidated. “Anyone who spent money to buy a vehicle would be most careful driving on roads in the Onitsha area,” a businessman, Reginald Maduako told The Guardian. “The pot-holes are so many and on virtually all Onitsha roads that vehicle parts like shock-absorbers, ball-joints, clutches and wheels are routinely damaged.“Vehicle-owners in Onitsha must be running up one of the higher bills on routine maintenance than their counterparts in any other city of the country”, he said. Residents say the state of roads in the area has been worsened by the Federal Government’s “nonchalant attitude to the plight of the masses, especially on road construction and other infrastructural development in Onitsha. “How can anyone explain the Federal Government awarding an important road contract to a company that has been known for not ever completing a road project on time. “This company was awarded the Onitsha-Owerri Road project contract alongside another, RCC Limited. “Of course, RCC had finished its portion, while the company in question is yet to do so, five years after.” It has also emerged that at the time the road contracts were awarded; the ever-busy stretch from the Niger Bridgehead to Zik’s Roundabout was not included in the original plan. “ This development was said to have been unacceptable to the state government, which made a strong case for the inclusion of the Bridgehead- Upper Iweka- Zik’s Roundabout. “ Five years after this inclusion, the company scraped the road badly, especially at New Parts Market, down to New Tarzan Junction, former Ogbunike Toll Gate and Umunya and abandoned the job. “They even moved their equipment off the work-sites, claiming they had not been paid for the job they had done and laid off over 600 indigenous staff of the company.” The recent accident at the Umunya section of the road in which over 35 people died and many more injured has been blamed on the poor state of the road. “The victims were trapped and roasted, as their vehicles were trapped in the bad stretch of road, already scrapped but not yet tarred. A source at the Anambra State Road Safety Commission (ASRSC) told The Guardian that 179 people died last year on the same road, while 276 were wounded.Rather than wait for the Federal Government and the contractor any longer, residents are asking the state government to go ahead and rehabilitate the road and then make a case for a refund. In fact, the state governor, Mr. Peter Obi, is said to have sought Federal Government’s approval to rehabilitate the stretch of road from the bridgehead to former Toll Gate to Amawbia to Amansea and Awka. A group under the aegis of Concerned Residents of Onitsha (CRO) has decried the deplorable condition of roads in the town and are urging Obi to rehabilitate the roads and seek a refund. The Deputy Minority Leader, representing Onitsha II Constituency in the House of Assembly, Emeka Idu, has also appealed to Obi to urgently repair the roads in the area to ease movement of people and goods. Attempts to get officials of the Federal Ministry of Works in Anambra State to comment on that claim and other issues failed. 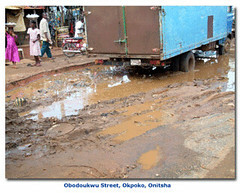 Onitsha the most important commercial center in eastern Nigeria is in shambles and needs immediate attention. Governor Peter Obi and his administration must now listen to a voice of reason and logic without being defensive. This is not time to verbalize any constructive advice as an opposition and as a voice of acrimony to the administration. After all a descending voice and constructive criticism cannot be easily discarded but must be weighed for its worth. The influential sociological–commercial integrity of Onitsha that is fast diminishing must be revived with re-construction, refurbishment and environmental facelift. The famous Upper Iweka Road in Onitsha has been branded, "Anambra crime headquarters," in a write-up published in Daily Sun and The Nigeria http://thenigeria.com/index.php. In the article the writer, Aloysius Attah gave a mind-bending description on how robbers, kidnappers, lawlessness, and pure evil ‘reigns’ in a back drop of filthy and refuse overflowing environment. Onitsha is too important to Ndiigbo and Nigeria to be left to go down in the dustbin of decay and rottenness that characterized a failed urban township in the 21st century. 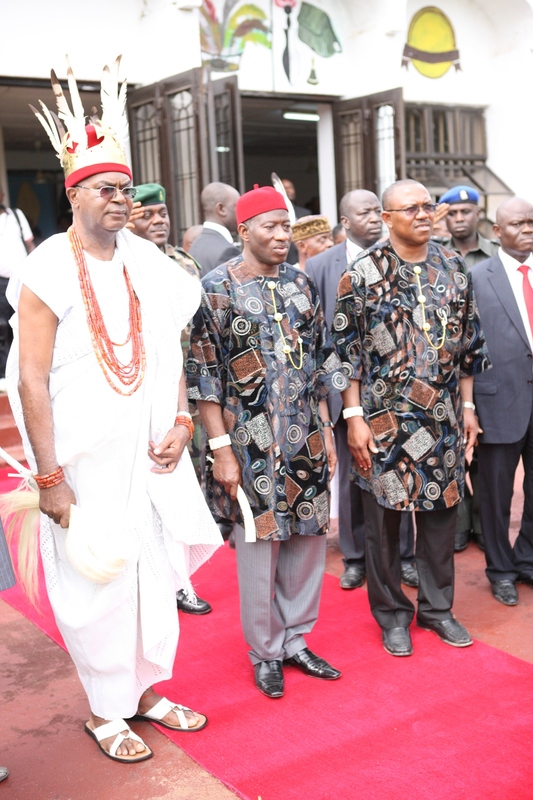 Onitsha has given a lot to Anambra state including the birthplace of the first Nigerian President Rt. Honorable Dr. Nnamdi Azikiwe, Louis Mbanefo and many others. Onitsha gave us Main Market, the largest open trading center in West Africa. But today’s Main market is unkempt – a health hazard without indoor plumbing and running water. How can this be possible when the Governor Obi did promise that he will make the development of Onitsha the hallmark of his administration? 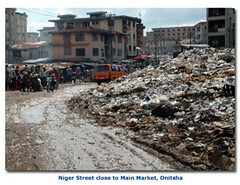 Governor Peter Obi should set up a committee of technocrats and technical advisers on Onitsha because it is quickly becoming a lost town - dirty and unkempt, mesmerized with refuse, debris, pot holes, and penetrating darkness at night. It is essential that the state of Onitsha must be improved not just for sake of reviving the commercial integrity of Onitsha but also for health benefits that comes with clean ambience and healthy environment. The proposed technical committee must consist of experts, technicians, traders and stakeholders. 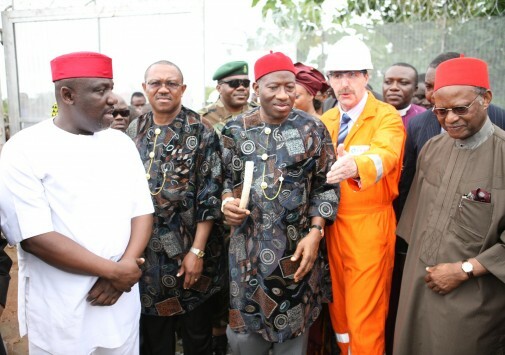 They will be given assignment to come up with solutions, remedies and methodology to improve and reconstruct Onitsha. This is not time to prattle about Governor Obi’s Anambra State Integrated Development Services (ANDIS) for it has become self-evident that it is not working for Onitsha. To technically and scientifically measure the correlation between ANDIS and its presence in Onitsha, the result will almost end up in zero percentiles. Therefore let not waste our time to debate whether the administration blue print ANDIS for development is working for Onitsha. For inspite of noise making about ANDIS, its presence in Onitsha remains a mirage. Onitsha is still the dirtiest major township in eastern Nigeria without running water, traffic lights, refuse recycling center to mention but few. Onitsha has deteriorated to its nadir level that Onitsha of 1970s and early 1980s were much better and appealing than Peter Obi’s Onitsha of 2011. It sounds incredible but it is the bitter truth. That past decades of 70s and 80s was Onitsha that had running tap water managed by Water Works and gutters/ditches were not clogged with solid waste and debris. The generated refuse and trash were safely hauled from residential homes to landfills at stipulated intervals in the yesteryears of those decades. Many of Onitsha residents which are mostly traders and business men may be politically powerless and may find the system cumbersome and time consuming to be leverage for development. That does not mean that they are not observant and recognized quite well that the health and wellbeing of their town is nothing to write home about. The political actors and elected politicians in the state took Onitsha residents lack of political involvement as their acquiescence to the status quo. But if the truth be told the people have been disengaged from the polity because it is not working for them rather they go about doing their trading nonchalantly without attracting necessary attention to themselves and their families. What does Onitsha really needs? 6. The re-dredging of Otumoye/NwangeneCreek to lessen the effects of flooding disaster at Fegge, Oboko and surrounding sub-municipalities. The continuous inspection of the storm water ditches to discourage mosquitoes inhabitation and subsequently malaria. 7. The rebuilding of electric infrastructure and provision of electricity at a limited capacity. It is quite understandable that the state government does not have the prime control of electric energy generation and distribution. The responsibility lies with federal government but that does not imply that the state government or Anambra state for that matter cannot contribute to the improvement of the process. Anambra state can start by acquiring solar panels to provide street lights. It was a good move on behalf of Anambra state on the visit the Governor Peter Obi paid to the Minister of Power Professor Nnaji. It must not be just a courtesy visit for photo opportunity but a visit that the governor should equipped with a detailed proposal on improving electricity deliverance that he should present to the minister. The time has come to do justice to Onitsha and its residents by transforming it to a place worthy of its historical significance and it’s continue importance as the commercial nerve center of Anambra state. Governor Peter and his administration including Anambra State Environmental　Protection Agency (ANSEPA) are not pro-active in the collection and disposal of refuse in Anambra State in general and Onitsha in particular. Despite the restive public relation by his administration on pages of newspapers, the refuse disposal in Onitsha and Anambra State is not being executed properly and it is saddled with poor management. There is no doubt that Governor Peter Obi has been trying to come up with the policy and standard of operation for hauling the refuse and debris from homes and streets of Onitsha. But there are lapses, holes and vulnerabilities in his overall operation in the disposal of solid waste that hampered his unelaborated effort. The whole truth is that solid waste disposal scheme is not functioning properly. The removals of the refuse from residential homes are not consistent but infrequent and inadequate.There is no established and consistent framework that will stipulate the frequency of trash removal be it once or twice in a week or biweekly. The problem with Obi’s administration is his inability to decide whether a taskforce/appointed contractors or the environmental commission ANSEPA is responsible for collection and environmental safe disposal of refuse and solid waste. As you walk around or drive through nooks and corners of Onitsha there are still refuse and waste abandon on street corners and inside the drainage system. These are serious and have deteriorating health implications for the citizens living in close proximity to the massive littering and exposure to the rotten solid waste. 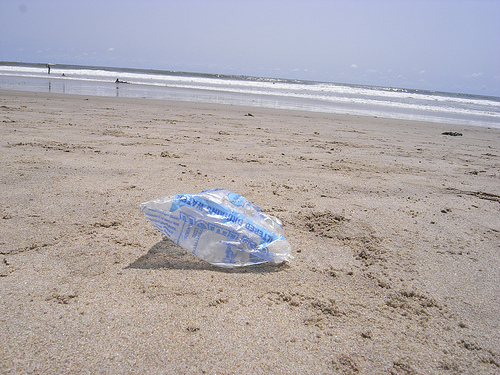 These abandonments of decaying refuse are becoming the ideal center for breeding of both water and air borne diseases. In addition the trash deposit becomes a breeding ground for mosquito parasites that comes with malaria. Apart from the deformation of environmental integrity, the unkempt image of heaped refuse and solid waste are blocking pedestrian pathways and the wastes have some detrimental effects on the ecosystem and the urban dwellers. This is why it is necessary that safe removal of waste must be given a highest priority and attended immediately with most serious attention. The menace and severity of malaria and mosquito can be easily controlled by safe removal of refuse that filled the dirty aqueous potholes on the streets of Onitsha and roads of Anambra State. The urban dwellers derived their drinking water mostly from water boreholes and there are possibilities the residues of waste material could sipped into the water, thus injecting e-coli bacteria that causes cholera, diaherra and stomach upset. The environmental pollution of the air becomes apparent when refuse and waste are allowed to decay further and commence to discharge some toxic gases that are harmful to human and the ecosystem. Apart from the pungent smell of abandon refuse, the emission of methane and nitrogenous gases from the decomposing refuse can cause serious medical mishaps to the residents of Onitsha and Anambra State. There must be a clear stipulation without confusion whose party or team is responsible for attending and removing of waste. The government of Anambra State has contracted some companies to go and make sure that inhabitants of Onitsha are paying their refuse disposal fees. But the objectives, modus operandi and operational responsibilities of the appointed contractors are not clearly defined. Are the contractors mandated to collect fees and if so on what ordinances are they acting on? In this case who will the people hold responsible when trash are not removed. The citizens of the state must be promptly informed on the fees they suppose to pay, the location for the payment and the type of containers that are needed for dumping their refuse. For the outcome of achieving a clean environment requires education and information on both ends – the government and the people. To keep the city clean and make littering a history in the state the people must be impacted with necessary information and the government officials must be familiar with the environmental ordinances and they must be equipped with the technical know-how to communicate effectively with the citizens. The information including the frequency of removal and what to do with other materials like bottles and plastic, oil, paints and others which are not essentially decaying materials. Instituting a policy for picking up refuse is more than providing a hauling truck but must involved a consistent planning and execution that ensures that trash are safely removed from the generated point to a recycling center and finally to an engineered landfill. In Anambra State and Onitsha in particular the abandoned sachets of 'pure water' are grossly littered across on the ground, ditches and gutters. Whenever it rains those empty sachets migrated into the streets and drainages. With a well established BMP, the methodology of collection can be re-visited and adjusted when necessary. 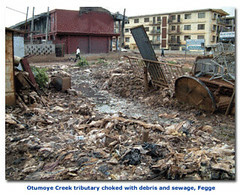 The problem of not having an established standard of operation in Onitsha becomes self-evident when it rains resulting in massive over-flooding due to the blockage of drainage convergences by the waterproof polymers and solid wastes. Governor Obi cannot afford to give lip service to the issue of refuse collection and disposal because the health wellbeing of the residents of Onitsha and Anambra State will be greatly impacted by environmental degradation due to incompetence and dereliction of duty. Onitsha the commercial Mecca of Anambra State in Nigeria, the city that gave us Main Market, the largest market in Africa, has been neglected so much that it desperately cries for a facelift. Some of the roads are so deteriorated that they pose both traffic and health hazard to the urban habitants. The quality of life has been and will continue to depreciate if the trend is left unchecked. The multiplicity of the pot-holes unfortunately has become pool of dirty waters and raw sewage. With these facts, the pot-holes teem with mosquitoes. The devastating effect of mosquitoes and its malarial consequences cannot be overemphasis within this context. Wastes and refuses that litter all the nooks and corners of Onitsha especially streets and roads contribute to this menace. There is no adequate waste management program for the collection and disposal of refuse. The ubiquitous trashes are health peril to the urban dwellers; the reckless abandon of rubbish has however, diminished and disfigured the aesthetic configuration of the city. With the governor Mr. Peter Obi at helm of affairs, the local and state governments could liaise to formulate sound environmental course of actions and principles that will revive Onitsha. A solid waste service and prudent management must be instituted for the collection, disposal and recycling of discarded materials in a manner that will be safe, efficient, environmentally sound and cost-effective. A blueprint strategy of comprehensive refuse disposal to the landfill in Onitsha will spell a new beginning for the city and its inhabitants of nearly 2 million. This will create a neat ambience that will automatically elevate the quality of life. By improving the environmental quality of Onitsha, it will definitely spur rapid economic development. This is possible because it will attract new businesses and capitalists - who will be willing to invest in the city and as well, spend some time there. Not only that the improvement will facilitate business activities; it will also help to position Onitsha as a Mecca of business and tourism in Nigeria. Environmental deterioration in Onitsha does not augur well for the citizens of Anambra State in particular and Nigeria in general, in view of the sociopolitical and economic symbolism Onitsha stands for. These have significantly diminished against the status quo -due to neglect and in-action. A city that had produced great legal and political bigwigs like Dr. Nnamdi Azikiwe, Sir Louis Mbanef and others, who were in vanguard of Nigeria's independence struggle and actualization, cannot be abandoned to rust and decay. The task of rebuilding, restoring and refurbishing a new city does not rest entirely on finance, though it is important, the primary and key condiment is the political will. The resolve to combat the detrimental state is and must be rooted on the political will and commitment. All stakeholders -politicians, government executives even public companies (as a result of their social responsibilities) must seize the opportunity at this moment to act on the best interest of the masses. Initiating a master plan and mustering the will-power to move forward must be the order of the day. The electorates have rendered power or mandate to the leaders through their elections into offices for an all-encompassing performance. With the exception of God, no other is more sacred than the votes of the electorates. The Governor and Chairmen of the local governments need no extra mandate than the power already derived from the people as reinforced in the constitution. Leadership must therefore, take the bull by its horns, by nipping this menace in the bud. The major environmental defect is the refuse abandonment, which must be tackled to accomplish the lofty task of creating and cultivating sustainable strategies for a cleaner environment in Onitsha. The initial strategy is to constitute a task force under the auspices of the ministry of works, which will then come up with the comprehensive plans to formulate the methodology and implementation of refuse disposal. The committee will formulate environmental policies and ethics that will delineate the responsibilities of the private citizens and government officials in sustainable clean environment. External monitors and strategists in the form of experts, consultants and managers are needed to work with government. Government alone cannot segregate itself from the private enterprises towards the planning and implementation of sustainable clean environment. In the free market economy, the presence of private industries does enable fast delivery of services and portends well for probity, transparency and it deepens capitalistic democracy.